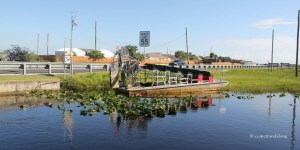 This was one of the adventures we wanted to try during our Florida trip: an airboat ride in the wetlands of Everglades. My recent post on Everglades National Park indicates there is abundance of wildlife in this park; specially Alligators; and Gator park offers close encounter with the wildlife. 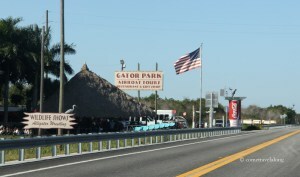 We drove from Miami to Gator park in the morning. 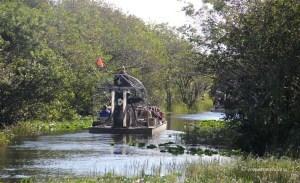 The park offers a souvenir shop, a 30 minute airboat tour, an alligator show and a small restaurant. We reached at the Gator Park. We started with the Airboat tour. There were many groups for taking this tour and we waited in the queue for our turn. An airboat parked at one end. The tour begin and we started to move swiftly on the canal. 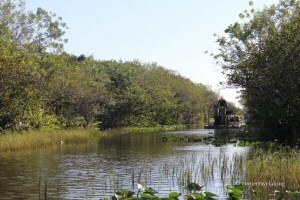 The tour guide provided us some knowledgeable facts about the Everglades and the alligators. 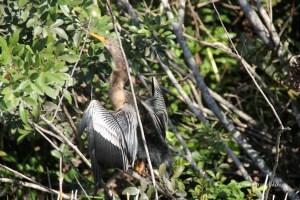 We saw an Anhinga on the branches of a near by tree. 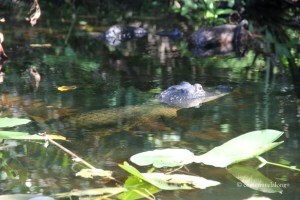 An alligator swimming in the marshy area.